I love the sunlight at this time of year, especially in the late afternoon. There’s a gorgeous softness, depth and warmth to it. Other than to sweep up a tonne of leaves and pick up windfalls, I haven’t spent much time in the garden lately but I did pop out this afternoon to catch a little sun. Miscanthus sinensis: these plants were propagated from a chunk taken from a big clump in our previous garden before we moved here. We originally bought this beautiful ornamental grass about 12 years ago from The Plantsman’s Preference, a fabulous nursery in Norfolk that specialises in hardy geraniums and ornamental grasses. 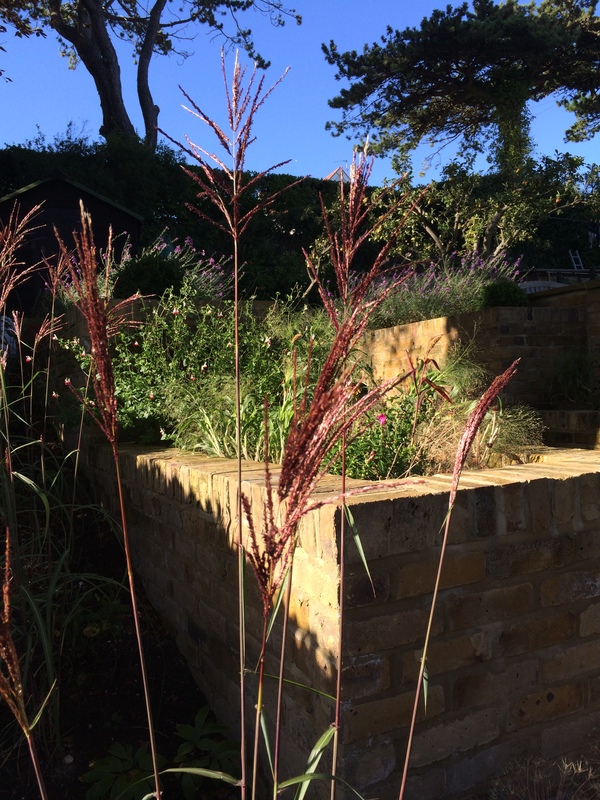 I can’t remember the exact variety of Miscanthus – the label is long gone – but there are over 40 of varying sizes and colours on their website. The raised planters either side of the steps have really filled out and are looking rather overgrown and chaotic. 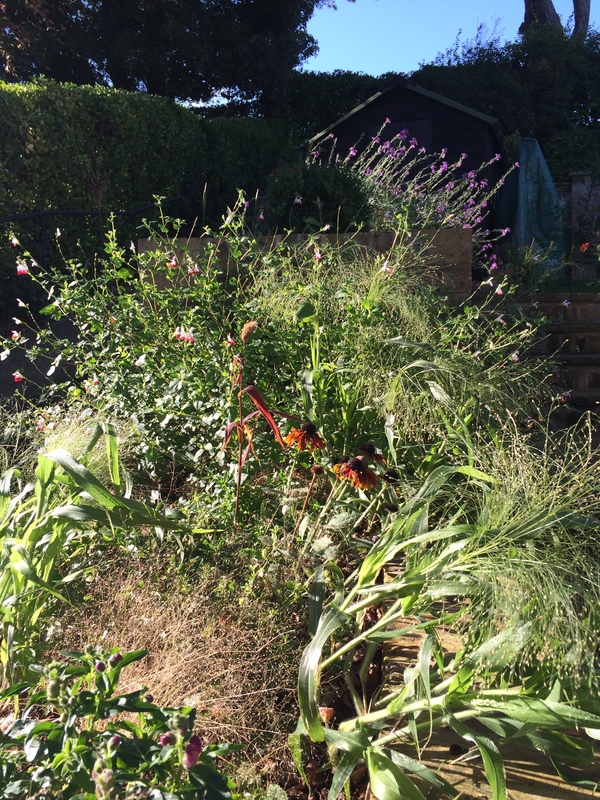 Annual grasses, including Panicum elegans ‘Frosted Explosion’, Salvia ‘Hot Lips’, rudbeckias and snapdragons (emergency planting for the garden safari back in June) have grown together in a frothy mass. 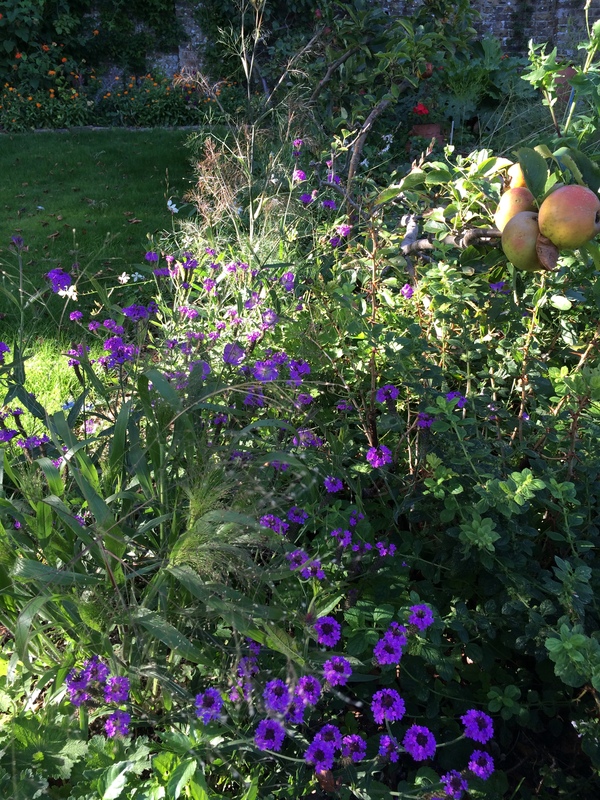 This is one of the planting combinations I’m most pleased with this year – Verbena rigida (which has been flowering for months), a blue/purple geranium of unknown variety, Gaura ‘The Bride’, a bronze fennel (that appeared out of nowhere) and more annual grasses. As much as I dislike the invasive habit of Japanese anemones, you can’t deny they look completely beautiful when they’re flowering en masse. In other news… It’s been a busy, long week. As well as the first full week of Back to School with all three children having to be out of the house by 7.35am, David has started a new job which means he’s away from home for most of the week. We’re all getting used to this and settling in to our new routines which means Being Organised: packing school bags the night before; eating a good breakfast to keep you going throughout the day when you’re too busy ‘socialising’ at lunchtime; keeping on top of increasing amounts of homework after a long summer of not picking up a pen; going to bed early… We’ve managed one week. I wonder how long it’ll last! I hope you’ve had a good week and are enjoying some September sunshine wherever you are. My sunny middle son is 14 (14!!!) today. 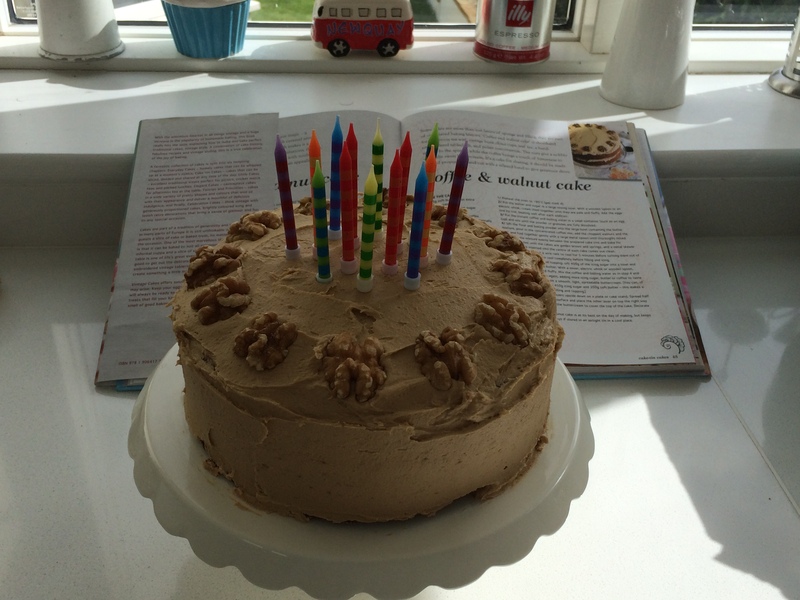 He requested burgers for dinner and a coffee and walnut birthday cake. I was pleased to oblige. I also enjoy the softer light of September. My kids are out of the house now, but I well remember those back to school mornings in fall. The cake looks delicious! I couldn’t agree more about the quality of September afternoon light, it’s perfect on a good weather day. Thanks Annie. 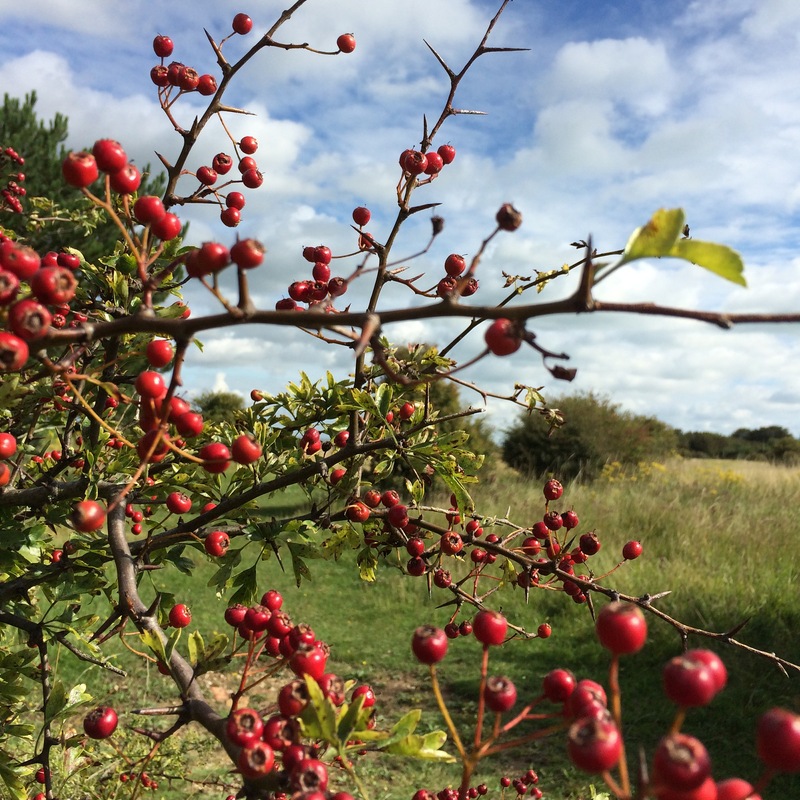 Hopefully there’ll be more autumnal sunshine for photos in the next few weeks. Thanks Amy. 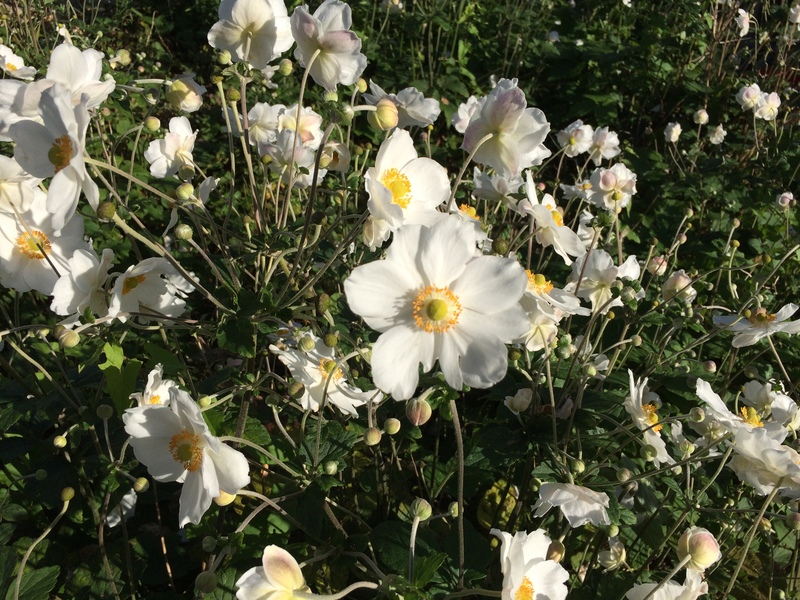 It’s a shame we don’t live nearby – I’d dig up a big clump of anemones and bring them over. We have a LOT. Beautiful photos, beautiful sunlight, beautiful garden and C&W birthday cake – what could be better! Good luck with the new routine. Mine were spoilt with a 5 minute brisk walk throughout their school careers. And please tell me, how did you manage to split your miscanthus? Mine was so dense I couldn’t even saw through it. It’s languishing in the undergrowth now offering a good home to earwigs and beetles! Happy birthday to your son! Your light is looking beautifully golden at this time of year. The flowers are looking lush too. Thanks Jennifer. Have a good week. I know exactly what you mean about the light. You can just tell it’s autumn, the sun is lower and brighter somehow, but less harsh. We’re not fabulous early risers, so it’s been a challenge getting out of the house at that time. It does mean that I can fit a lot more into a morning though! Thank you Sarah. It’s not an ideal situation but we’re making the best of it and appreciating the times when we’re together. Congratulations on the new job – I hope a suitable quantity of champagne was consumed. If the house is too quiet and you feel like a midweek jaunt to London do let me know! Hi Sam, Thanks for your comment over on my blog. I’m so glad you found me as your blog is lovely and I shall look forward to dropping in with you again. We’ve had school returns here this week too, as well as a university beginning. Big steps that fade to small ones after a few weeks of the new routine becoming normal.